Some say that these festivals and feasts days had a special significance to the Israel of the Old Testament, so they should still have similar special significance to the Israel of the end time. It is my hope that though this study, light will be shed on this subject and you will gain a deeper insight into how these special sabbath days fit into modern Christianity. There were seven festivals of the sanctuary in the Old Testament: Passover, Unleavened Bread, First Fruits, Feast of Weeks, Feast of Trumpets, the Day of Atonement, and the Feast of Tabernacles. These seven ceremonial festivals were held on specific days, and the cycle was repeated every year. Let’s look together at how these feasts fit into Old Testament times, how they relate to the New Testament, and how we should relate to them today. The Bible is clear about how the Lord gives His people many examples of “type” and “antitype.” The type, or symbol, represents the antitype, or fulfillment of the symbol. The antitype is always greater than the type. The earth also was corrupt before God, and the earth was filled with violence…And God said unto Noah, The end of all flesh is come before me…and, behold, I will destroy them with the earth…And all flesh died that moved upon the earth…and every man…and Noah only remained alive, and they that were with him in the ark (Genesis 6:11–7:23). But as the days of Noah were, so shall also the coming of the Son of man be. For as in the days that were before the flood they were eating and drinking, marrying and giving in marriage, until the day that Noah entered into the ark. And knew not until the flood came, and took them all away; so shall also the coming of the Son of man be (Matthew 24:37-42). For as the lightning, that lighteth out of the one part under heaven, shineth unto the other part under heaven; so shall also the Son of man be in his day…And as it was in the days of Noe, so shall it be also in the days of the Son of man…Likewise also as it was in the days of Lot; they did eat, they drank, they bought, they sold, they planted, they builded; But the same day that Lot went out of Sodom it rained fire and brimstone from heaven, and destroyed them all. Even thus shall it be in the day when the Son of man is revealed (Luke 17:24-31). Let’s look at another example of type and antitype: the Exodus from Egypt, which happened when Moses and Aaron confronted the Pharaoh and commanded him to let the Israelites go. And afterward Moses and Aaron went in, and told Pharaoh, Thus saith the LORD God of Israel, Let my people go…And Pharaoh said, Behold, the people of the land now are many, and ye make them rest from their burdens (keep the Sabbath). And Pharaoh commanded the same day…Let there more work be laid upon the men, that they may labour therein…Then the LORD said unto Moses, Now shalt thou see what I will do to Pharaoh…For I will at this time send all my plagues upon thine heart, and upon thy servants, and upon thy people; that thou mayest know that there is none like me in all the earth (Exodus 5:1,5–6,9; 6:1, 9:14). And the children of Israel journeyed… about six hundred thousand on foot that were men, beside children (Exodus 12:37). This figure is only that of the heads of the family. Families of the time had five members on average. There were over 3 million people that moved out of Egypt with their cattle, sheep, goats, and geese into the desert. If one were to take least possible scenarios, and estimate that a family of five, including children, the carts with the luggage and the livestock would take up an area of 25 square meters, then the people Israel would have stretched over a total area of 15,000 square kilometers! This means that, if the front line of the group, as they walked was 50km wide, then the group would have stretched 300km back! Without taking the livestock into account, the people alone would have consumed over 4.5 million litres of water per day! What about the manna? If on average, each person only ate 1 pound of manna per day, there would have had to be over 1,500 tons of manna needed every day! The Exodus of Israel from Egypt, which is the type, was a mammoth task, but the Lord was true to His Word. He called Israel out of Egypt in order to take them to the promised land. It is interesting to note that the substantiating argument for the release of the Israelites revolved around the Sabbath. Pharaoh was not letting Israel rest as God commanded them to do, so God called His people to come out of Egypt, which was a land governed by Satanic religions and pagan ideologies. And after these things I saw another angel come down from heaven…And he cried mightily with a strong voice, saying, Babylon the great is fallen, is fallen, and is become the habitation of devils, and the hold of every foul spirit, and a cage of every unclean and hateful bird…And I heard another voice from heaven, saying, Come out of her, my people, that ye be not partakers of her sins, and that ye receive not of her plagues…Therefore shall her plagues come in one day, death, and mourning, and famine; and she shall be utterly burned with fire: for strong is the Lord God who judgeth her (Revelation 18:1-2,4,8). Just like with the first Exodus, the second one in Revelation 18 (the antitype) is also a call to come away from Satanic religions and pagan ideologies. This clear type and antitype is made even clearer in the context of the final plagues. Just as it was with the first Israel, the main substantiating argument and core issue for new Israel is the authority of the seventh-day Sabbath. We see this in Revelation 14:9, where the warning to humanity about receiving the mark of the Beast, is highlighted. From various Bible studies it is clear that the Mark of the Beast is the seal or stamp of authority of the Antichrist Beast—the Papacy of Rome. His mark or seal of authority supersedes the authoritative seal of God, which is the Sabbath commandment in the heart of God’s law. In Revelation 18, the Lord is telling His people to have nothing to do with a system that claims to have greater authority than God—a system that puts a false Sabbath in the place of the true Sabbath, thereby covering up the day that proves the authority of God. This is exactly the same as with the Pharaoh in Moses’ day, who claimed greater authority than God, by ignoring the Sabbath Commandment. The perfect parallels between Noah’s flood (and Sodom and Gomorrah) and Judgment Day, as well as the Exodus in Moses’ day and the spiritual exodus at the end time, show how the Lord reveals future events to us by giving us actual historic examples so that the greater antitypical event can not be misunderstood. As I stated earlier, the type in these examples is sort of a shadow of what is lying ahead. Let us now go back to the sanctuary and look again at the feasts and festivals. The sabbath days (sabbath with a small “s” denotes a special day, feast, or festival), as were fulfilled in Moses’ day, were contained in what was known as the ceremonial law. And it came to pass, when Moses had made an end of writing the words of this law in a book…Moses commanded the Levites…saying, Take this book of the law, and put it in the side of the ark of the covenant of the LORD your God that it may be there for a witness against thee. This ceremonial law contained all the rules of the Sanctuary, and laid out in full detail the requirements of the special feast days. The first law—the law of Ten Commandments—was written by God in stone, signifying that the precepts it contained would stand eternally. The second law—the ceremonial law—was written by Moses on a parchment, signifying that the precepts it contained would be temporary. The sacrificial system, as instituted in the Garden of Eden, was fully operational in Moses’ day. The Lord gave Moses greater knowledge about many other areas of Israel’s responsibility towards God. This information was written into the ceremonial law, and the temporariness of this second law meant that it would fall away somewhere in the future. This becomes key to our discussions. Has this law fallen away, and if so, where and when? If it has, have the festivals gone with it, or are there some aspects we should still be fulfilling today? We will have to look at both the historic events after Moses’ time and the Word of God, in order to confirm what transpired concerning this second law, which contained the feasts and festivals of the sanctuary. The first feast day of the year was the Passover. On this day, a lamb was to be offered to God, but there were specific facets that were to be considered during this festival. Remembering, as with the examples given above, this feast day was possibly a shadow of a future event. In the tenth day of this month they shall take to them every man a lamb…without blemish, a male of the first year…And ye shall keep it up until the fourteenth day of the same month: and the whole assembly of the congregation of Israel shall kill it in the evening. And they shall take of the blood, and strike it on the two side posts and on the upper door post of the house, wherein they shall eat it. And they shall eat the flesh in that night, roast with fire, and unleavened bread; and with bitter herbs they shall eat it…it is the LORD’s passover…thou shalt not carry forth aught of the flesh abroad out of the house; neither shall ye break a bone thereof. All the congregation of Israel shall keep it. There are some specific aspects we need to look at here before we move on. 1. The Passover was a memorial to the final events before the Exodus, when the angel of death “passed over” Israel. 2. On the tenth day (Nisan 10) the people of Israel had to take a perfect lamb into their home and let it stay in the home with them. 3. Four days later, on the 14th day (Nisan 14), the family had to kill the lamb in the evening. 4. They then had to put the blood of the lamb on the side posts and lintel of the door of the home where the lamb was going to be eaten. 5. That night they had to offer the lamb as a burnt offering, and roast the lamb in bitter herbs and eat it with unleavened bread. 6. They had to eat all of the meat and were not allowed to take any out of the house. 7. Lastly, while they were preparing or eating it, they were not allowed to break a single bone of the lamb. The Lord never does anything without a reason, so if they were not allowed to break any bones of the lamb, there must have been a reason for it. The same goes for the Lord telling Israel to take the lamb into their homes on the tenth day and then killing it four days later. This Passover feast was the type. Four days before His death on the cross, the Sanhedrin met and decided to condemn Jesus to death. This was Nisan 10. By their evil intentions, they had set Jesus aside at the same time as the Passover lamb was being set aside. Four days later (Nisan 14) Jesus was crucified. Mark 15:34 and 37 explains, “at the ninth hour Jesus cried…My God, my God, why hast thou forsaken me...And Jesus cried with a loud voice, and gave up the ghost.” The ninth hour is 3 p.m., and every year the Passover lamb was offered at 3 p.m. While the priests were preparing the Passover lamb in the sanctuary—as they had since the times of Moses—Christ was being put to death on a cross outside the city. As they were putting the Passover lamb to death, they were putting the true Lamb of God to death. Sadly they didn’t recognize their own prophecies. Incredibly, just as with the Passover lamb, none of Jesus’ bones were broken. Not only that, they pierced him with a spear, just as the Passover lamb was always pierced with a spit to roast it. Type had met antitype. Just as John the Baptist had prophesied in John 1:29, Jesus Christ became the Lamb that bears the sins of the world, just as the Passover lamb bore the sins of the sinner. The Passover offering of the lamb was a shadow of the true offering of the Lamb. Jesus came to Earth to live out the requirements of the Sanctuary to its fullest potential. Hebrews 10:10 states, “we are sanctified through the offering of the body of Jesus Christ once for all.” Considering this text from Hebrews, were Jesus followers expected to keep the festival of the Passover lamb after Jesus’ crucifixion? Remember for a moment that many people who accepted Christ after His resurrection were Gentiles, and would therefore have had no idea about the ceremonial feasts and festivals, and even less about the Passover sacrifice. Was it necessary for them, and the Jews who had accepted Christ, to fulfill the Passover festival after Christ’s death? The answer to that lies in the events that surrounded Jesus’ death on the cross. Let’s see what the Bible says happened as He died. Mark 15:37-38 states: “And Jesus cried with a loud voice, and gave up the ghost. And the veil of the temple was rent in twain from the top to the bottom.” With Jesus’ death, the antitypical Passover sacrifice was fulfilled. From that moment on, the literal sacrifice of a lamb on Nisan 14 would no longer be necessary. In fact the Lord would make sure that the sacrifice would not take place any longer. As Jesus breathed out His last breath outside the city, there was absolute chaos inside the temple. There was an earthquake and the curtain separating the Holy and the Most Holy was torn in two—from top to bottom. Jesus, when he had cried again with a loud voice, yielded up his ghost. And, behold, the veil of the temple was torn in two, from top to bottom; and the earth did quake, and the rocks rent. The veil was a mighty curtain—it was about six meters high and as thick as a man’s hand. No human being would be able to tear such an enormous piece of cloth, and the tearing of the veil from top to bottom indicates that it was the Lord who tore it. For the first time, the Lord exposed the Most Holy Place, which contained the Ark of the Covenant. Until that moment, the Lord had been present in the Most Holy of the earthly sanctuary, in the form of the light of the Shekinah Glory. This was the light that was above the Ark and between the covering cherubs. Sin is not able to withstand the presence of God, and anyone carrying unconfessed sin that was exposed to the presence of God in the Most Holy would immediately be killed. The role of the temple veil was to protect God’s people, as it separated the Holy from the Most Holy, keeping sinful people from being exposed to the presence of God. As Jesus died the Lord tore the veil open exposing the Holy of Holies. Had this happened in the past, everyone in the temple would have perished, as the Shekinah Glory would have destroyed sin and the sinners. If you take into account that Jesus died at the same time as the Passover sacrifice was taking place, it is an obvious realization that the chaos which was caused by the earthquake and the tearing of the veil, would not have allowed the priest to complete all aspects of the sacrifice successfully. Jesus fulfilled the Passover prophecy that said not a single bone should be broken, and He also fulfilled the requirement of having been pierced just as the Passover Lamb would have been pierced. It is clear that at that moment in the world’s history, the focus moved from the sacrificial system of the Old Testament sanctuary, to Jesus. The Lord destroyed the temple at the time Jesus died, making sure that no further sacrifices could take place. Jesus because the antitypical fulfillment of these prophecies. What about the Other Feasts? Jesus fulfilled the Passover sacrifice, but what about the other feasts and festivals? Well, quite simply, Jesus fulfilled those as well. Due to the Holy of Holies being exposed, the functionality of the temple had been destroyed and the feasts could no longer be maintained as was required by God. 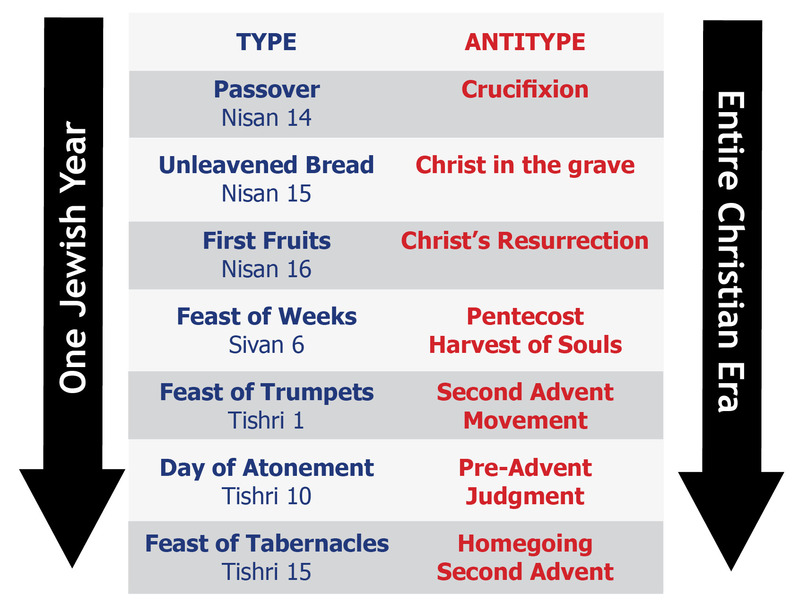 According to the ceremonial law, the day after Passover, Nisan 15, was to be the Feast of Unleavened Bread, and the day after that, Nisan 16, was the festival of First Fruits. After the ensuing chaos of the Passover sacrifice, none of these ceremonial feasts could take place. Quite simply, as the Jews had not recognized that the prophecies pointed towards Jesus becoming the fulfillment of the Sanctuary, they would have continued sacrificing animals as they had done for so many centuries. The Lord therefore destroyed the functionality of the temple to force the Jews to stop sacrificing animals. With Jesus’ death on the cross, the sacrificial system, with all its feasts and festivals came to an end. This is explained beautifully in Colossians 2:13-17. This passage explains that the ceremonial law was nailed to the cross. That is, with Jesus’ crucifixion, it was made null and void. For this reason, people can no longer judge God’s people if they do not keep the holy days and Sabbath days of the ceremonial law. Jesus sacrifice on the cross was “Blotting out the handwriting of ordinances that was against us, which was contrary to us, and took it out of the way, nailing it to his cross…Let no man therefore judge you in meat, or in drink, or in respect of a holyday, or of the new moon, or of the sabbath days: Which are a shadow of things to come; but the body is of Christ” (Colossians 3:14, 16-17). The feasts, festivals, and sacrifices as laid out in the Old Testament, were a shadow of things to come. These ceremonies were the type, and Jesus fulfilled them as the antitype. Through Jesus’ death, burial, and resurrection, the first three festivals were fulfilled. Unleavened bread was bread without yeast. Yeast is used in the Bible as a symbol for sin. Jesus says, “I am the bread of life” (John 6:35), so the unleavened bread symbolized Jesus Christ who was without sin. 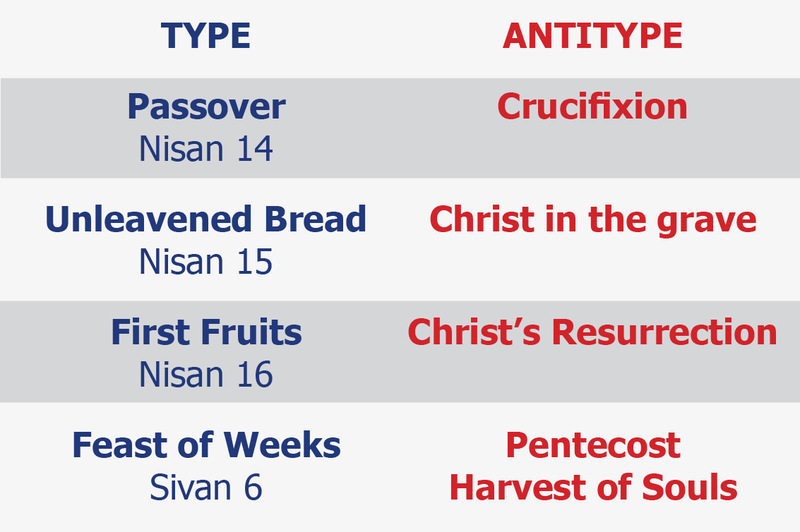 Nisan 16 was the feast of First Fruits, and this pointed towards Jesus’ resurrection (Matthew 27:52-53). After these three, came the Feast of Weeks, which was a shadow of the day the Holy Spirit was poured out at Pentecost. There were seven festival days in total, and the last three ceremonial feast days—Trumpets, Atonement, and Tabernacles—point towards 1843, 1844, and the Day of Judgment respectively. 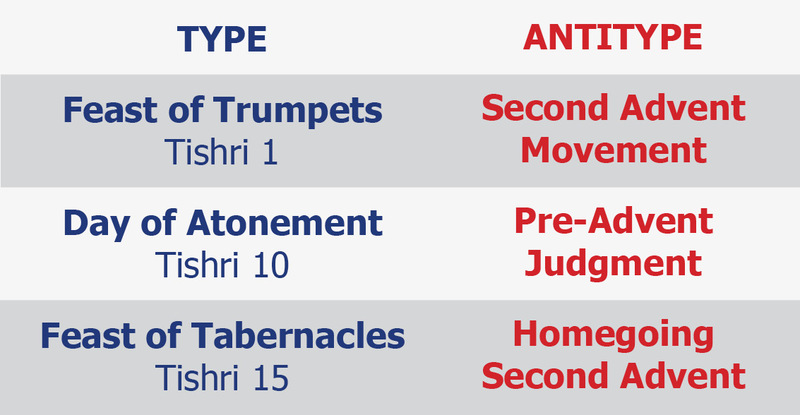 Trumpets in the Bible are used to symbolize loud warnings or cries that have to do with judgment. This was fulfilled when William Miller warned the world about the coming of the Lord in 1843. Based on the 2300-day prophecy, he predicted the world would end as Daniel 8:14 says, “then shall the sanctuary be cleansed.” When this date did not materialize, it was realized that they had miscalculated the BC/AD switch, as they realized there was no ‘0’ year. The dates were then recalculated and it was realized that this prophecy pointed towards 1844, not 1843. Again the message of judgment went to the world. When this date also did not materialize, most followers of the message fell away, but a few remained and through diligent study, they were lead to recognize that the prophecy points towards the heavenly sanctuary, where Jesus is our High Priest in the tabernacle that the Lord pitched (Hebrews 8:1-2). William Miller got the date right but the event wrong. The Day of Atonement was not pointing towards anything on Earth, but rather to the cleansing of the heavenly sanctuary in 1844. The last ceremonial feast—the feast of Tabernacles—points towards Jesus return, when He comes to fetch His children. Looking at the ceremonial feast days, one can immediately see that they point to events which stretch from the crucifixion right through to Jesus’ return at the end of time. Every year Israel would go through the seven ceremonial feasts. Year after year they would complete the cycle, fulfilling the typical feasts pointing to events that would take place at different times through out the entire Christian era. The Jewish year was the type and the entire Christian era was the antitype. When I consider the events around Jesus’ crucifixion, I realize more and more that, from the human perspective, there was huge risk involved in Jesus’ antitypical fulfillment of the sanctuary. Jesus had to put an end to both the physical sanctuary and the sacrificial system, while at the same time get His people to make a paradigm shift. No longer were they to rely on physical ceremonies, but rather become spiritually focused, connecting with God through the spiritual sanctuary, allowing Jesus to become their High Priest and Intercessor. It would have been an impossible task for any human being to do, but Jesus made this change successfully, and then in His wisdom, sent the Holy Spirit to help humanity make the required paradigm shift. The Holy Spirit today still guides humankind through the spiritual sanctuary. He convicts us of sin, and leads us to repentance, showing us that we need to accept the sacrifice and grace of Jesus Christ as the sole mechanism by which we can be save. The Holy Spirit also leads us towards the spiritual Most Holy Place, urging us to live a truly Christian life, where the world can see the effects of the law and the grace of God on our lives. The Feasts and Festivals of the Sanctuary—should we still keep them today? The answer I believe has become quite clear. In the ceremonial law, the Lord laid out a system of worship for the people of the Old Testament—it was a depiction of the plan of salvation. Through Jesus’ death, burial, resurrection, and ministry, He personally became the fulfillment of the Old Testament sanctuary feasts and festivals. Today we see how a year in the Jewish calendar depicted the period from Jesus’ crucifixion through to His Return. Each special Sabbath feast, as explained in the ceremonial law, pointed to a specific event somewhere in the Christian era, but as Colossians 2:13-17 explains, the ceremonial law, which laid out the requirements of the physical sanctuary of the Old Testament, was made null and void when Jesus was nailed to the cross. Jesus has not only become the fulfillment of the sanctuary’s feasts and festivals, but He also is the antitypical fulfillment of the other aspects of the Sanctuary as well. In answer to our initial question, if we were to keep the feasts of the Old Testament today, then we might as well go back to the sacrificial system. We might as well also look to rebuild the temple, close up the Most Holy with a veil again and look for a High Priest here on Earth who can perform the functions of the Sanctuary. By keeping the feasts and festivals of the Old Testament, it is obvious that we reject Jesus Christ as our Saviour. In fact, we reject Him as “the Lamb who takes away the sins of the world” (John 1:29), and we reject Him as our High Priest, Intercessor, and Advocate in heaven. Six of the seven festivals of the Old Testament sanctuary have been fulfilled. There is one last festival that needs to be fulfilled—the Feast of Tabernacles, which points to the day of Jesus’ return. All aspects of the sanctuary have been fulfilled, and this is the final event for which we are currently waiting. May we draw closer to God, as we pray daily that we may be found worthy on the day the Lord decided to become the fulfillment of His last ceremonial Sabbath. i Canon and Tradition, 263.
ii The Convert’s Catechism of Catholic doctrine (1957):50.